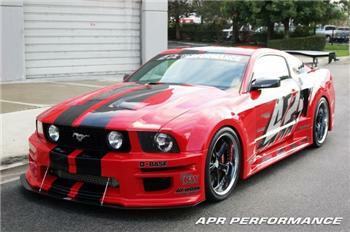 APR Aerodynamic Kit - Ford Mustang FORD - Dezod Motorsports Inc - Home of the automotive performance enthusiast since 2002. The GT-R Widebody aerodynamic Kit for the S197 Mustang gives an aggressive look while enhancing the smooth and subtle lines. This 10 piece kit helps to improve overall handling and traction. This aerodynamic kit increases the front stance by +45mm per front fender and +50mm per rear fender. It allows installation of massive front wheel sizes of 20”x9.5” with 285/30/20 profile tires and rear wheel sizes of 20”x 12.5” with 345/30/20 profile tires.